I wasn’t sure what to expect from this book really – I bought it almost exactly a year ago because I enjoyed Elizabeth Kostova’s previous novel, but then it got shoved to the bottom of my TBR pile and was promptly forgotten about. Because of the time lapse and the almost blank cover, I’d even forgotten what it was meant to be about. Now that I’ve finished the book, I think it’s actually very different from how the blurb makes it sound. I was half-expecting a Da Vinci Code-esque novel where Andrew Marlowe runs around uncovering various secrets behind paintings etc etc. The actual novel is more… well, domestic than that. He’s not getting anywhere with trying to talk to his patient and find out why he attacked a painting in the National Gallery, so he visits the two women in Robert Oliver’s life and they recount the stories of their troubled relationships with Robert. Because it’s basically Person A talking about Person B to Person C, the consequence is that all the characters seeming a little flat, even Andrew Marlowe who the narrative follows. This isn’t through Kostova’s lack of trying as every single character is described frequently in meticulous detail; they just don’t seem to jump off the page. They’re just unrealistic. Andrew Marlowe would be the subject of restraining orders submitted by those two women if the Bookworld had any sense of justice. The amount of detail and and effort that has been put into the novel makes it very, very long, it’s not a book you can whip through. During my first sitting, I was enthralled and sat there for hours until the real world dragged me unwillingly away. After that, however, I struggled to pick it back up again until I forced myself to sit and read and th en became just as engrossed as before. So it’s not a book you can read a few pages at a time – you have to be prepared to immerse yourself in the story. Speaking of, the story really is very good. Like her previous novel, it has an original plot that I’ve never heard anything even vaguely similar to before. As it progresses, it shows how the lives of all the characters intertwined and left Robert alone drawing portraits of an unknown woman in a psychiatric hospital. As I already admitted, I did lose interest in the characters a little, but the twists in the story kept me reading on. 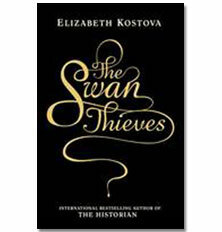 Although I found the ending a little rushed and the lack of explanation regarding Robert’s illness irritating, Elizabeth Kostova clearly has a gift for detailed story-telling. Looking back, this has ended up as quite a critical review, but that was unintentional. I thoroughly enjoyed this book and I will be rereading it in the future. As long as you’re prepared to put some effort in and work with it, it’s well worth a read. The author’s previous work, obviously. It involves the myth of the original Dracula and contains just as much detail and excellent story-telling as The Swan Thieves. This novel also follows the story of a painter and contains similar flashbacks into the life of a historical character. A much quicker and easier read, but still worth a read for the historical references.